Coromandel is famed as New Zealand’s destination for those who love the sun and sea. The stunning beaches in the North Island flaunt golden sand and pristine waters and make any budgeted holiday simply perfect. One such glorious locale is Waikawau Bay, one of the many beaches in the Peninsula of Coromandel. The region is created by the God’s for lazing on a beach all day or going along nature trails and walks around the hills or simply to gaze at the beauty of the terrain. There are thermal baths that enable you to soak in the goodness of a hot water bath and then pamper your body in the cool waters of the bay. Coromandel is clearly the ultimate in a New Zealand holiday. There are many lodging accommodations and restaurants that cater to the exquisite tastes of tourists from any part of the globe. You could choose a small group adventure in Coromandel or a snow tour exploring the Southern Alps. The humble and very hospitable Maoris and other locals offer you a hugely amplified Coromandel tour of a life time. The spectacular Coromandel Peninsula enables you to experience the freedom of New Zealand and the fantabulous combination of the coastline and magnificent mountains has created some of the finest motorcycling roads in the world! Coromandel makes a holiday an adventure to remember. The local fishing action and the fantastic, spectacular setting of the terrain have created a reputation for great fishing, and abseiling-rappelling. 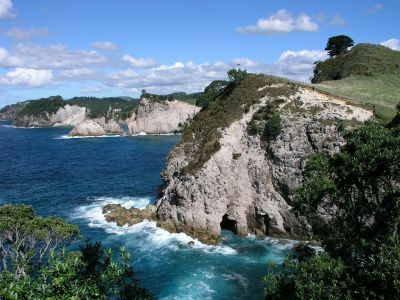 Coromandel is full of waterfalls, cliffs and crystal-clear pools – what more can one ask for to unwind!